While BIM can be applied to any situation, the focus of this discussion is upon – multi-facility portfolios, with extensive capital reinvestment, renovation, repair, maintenance, and sustainability requirements/projects. We are all faced with a significantly altered economic and environmental landscape: more to do, limited capital/cost cuts, more accountability and transparency, and the need to reduce our “carbon footprint”. Success in today’s world requires moving from a reactionary and needs-satisfaction mode to longer term strategies with associated options. This is a major shift in thinking for many, but especially for our business or “for-profit sectors”. Robust, proven processes with associated accurate transparent, and actionable information in support of fact-based decision-marking are drivers for success. Creation of a business-based capital reinvestment and asset management framework and decision-making capability are central requirements. Accurate, timely information is required for sound decision-making. Decisions regarding reinvestment into the built should be made in concert with the attainment and support of an organization’s mission. Technology is a tool to enable lower cost implementation of strategies and processes. Technology’s role is to assure consistent, cost-efficient application of embedded business process, enabling faster deployment, automation of routine or complex mathematical processes, and associated decision-making and reporting capabilities. Okay, so know let’s look a bit more about why BIM is not fully understood, nor being rapidly accepted across the Architecture, Engineering, Construction, Owner, Operations/Facility Management sector(s). Many, if not most organizations lack robust, consistent, and transparent planning policies and overall life-cycle management processes. Existing processes and construction delivery methods are largely antagonistic and outdated, with divergent goals for involved parties. Stove-piped mandates with many players, and unused or misunderstood information. Lack of clear direction and leadership focus, process management, and desired, quantitative outcomes. Lack of appropriate tools to assist the life-cycle management process, inclusive of appropriate data validation and standardization. The appropriate use of consultants, especially in the areas of “change management”. Lack of understanding and adopting of newer and more efficient construction delivery methods (Integrated Project Delivery – IPD, Job Order Contracting – JOC), contracts, and supporting technology tools. 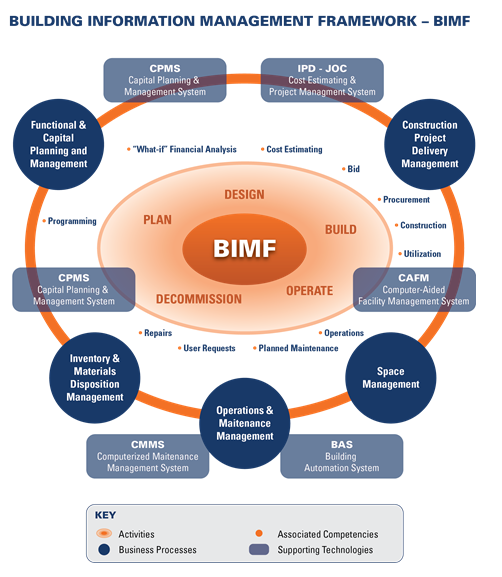 All aspects of BIM/faclity life-cycle managment, it’s organization, purpose, policies, assumptions, mandates, methods and scope must be discussed, agreed upon, and re-evaluated on a continuous, cyclical basis. It’s important that process ownership resides with everyone in the organization with appropriate expertise applied and shared from multiple knowledge-domains. Furthermore, that direct involvement and support of decision-makers and appropriate involvement of consultants and/or outsourcing is available. BIM/life-cycle facility management requires fundamental changes in business practices. Unfortuantely, change management is a tremendous chasm to bridge, and achieving any significant success using internal resource only is unlikely. 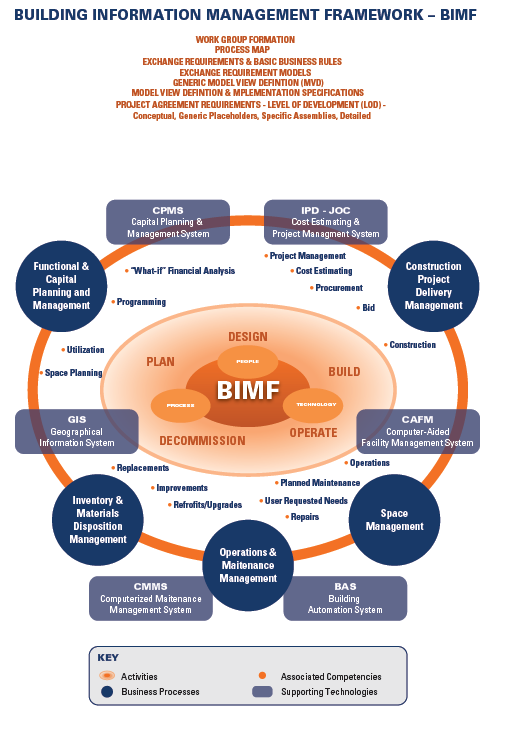 Just a few of the areas associated with implementing a BIM strategy are shown below. Anticipated outcomes must be linked to ALL decisions in terms of anticipated financial, functional and/or conditional improvements. Proprietary (e.g., Excel) and COTS tools for are used for various aspects of facility life-cycle management – strategic planning, capital planning and management/financial modeling, construction delivery, maintenance management, spaces planning/untilization, building automation/security, project management, etc. Relatively limited effort, focus, associated or investment is typically applied in consideration of integrating and rationalizing these various systems in terms of the validation and standardization of information across multiple knowledge domains. The piecemeal/ad-hoc approach is a symptom of process and cultural issues with an organization and/or lack of attention to change management. For example, a common “excuse” relative to this issue of integrating disparate technologies and processes is that the involved technology is” incompatible”. In today’s world, virtually any technology using current technology can communicate with another. The real issues reside in the people and process that create the information. The inherent “fear of change” and traditional lack of collaboration among various professional discipline are the fundamental issues to be address. A good example is the continued use of proprietary spreadsheets for cost estimating and other somewhat complex domains. The use of spreadsheets is well beyond their technologies ability. Spreadsheets are single user and non-collaborative, have no concept of hierarchy, nor full audit capability. In short, spreadsheets are inefficient and costly to maintain at best, and are costly relative to information reuse or updating. 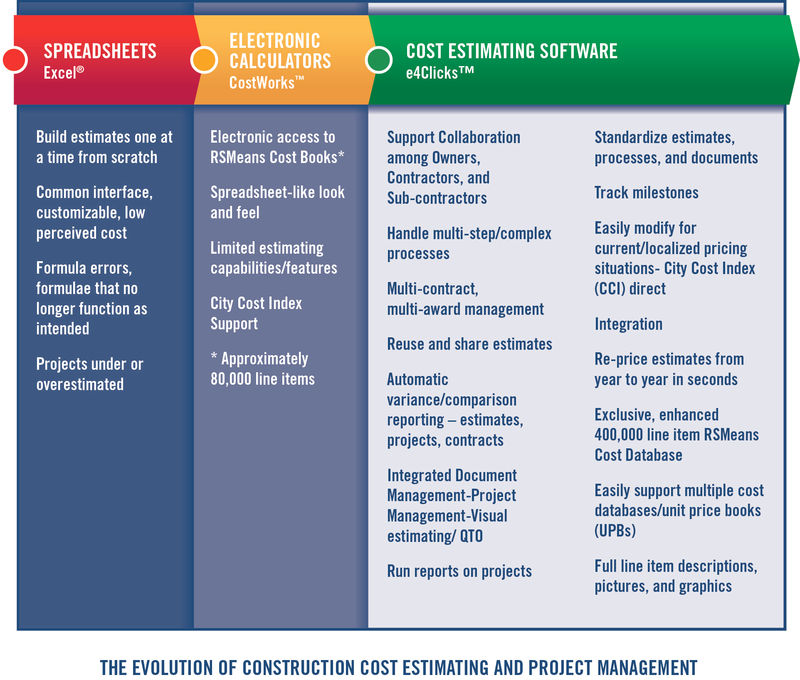 Spreadsheet use cost estimating and cost control for facility portfolios is unfortunately both pervasive and untenable. Similarly CAD-centric visualization tools, such as Revit and AutoCad [from Autodesk], SketchUp (graphical design), Archicad, Bentley, etc. are excellent data visualization tools however, should not be confused as a turnkey BIM life-cycle management solutions. Relational database centric systems offer enhances data management, however, do not afford the flexibility of spreadsheets. Newer cloud-based technologies and associated offer higher degrees of collaboration, transparency, and flexibility. 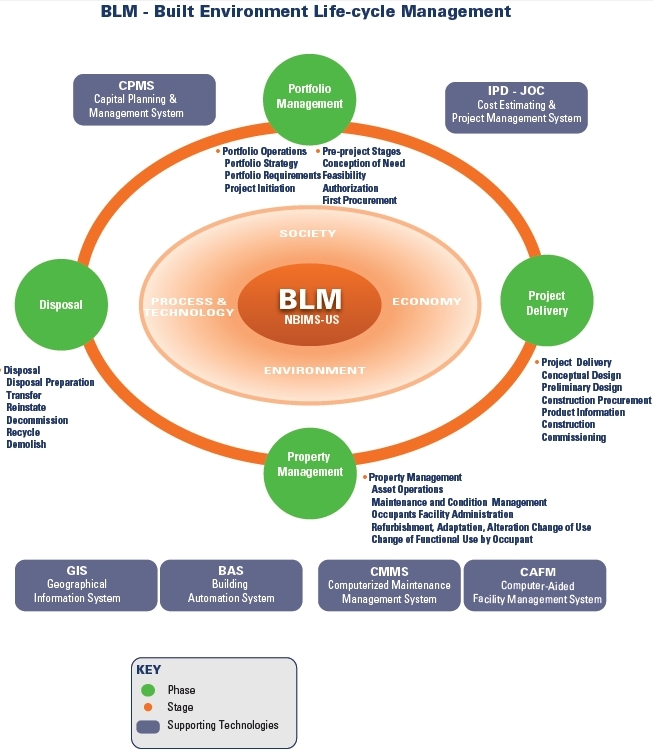 Any attempt at life-cycle facility management – BIM will have little or no value unless based upon a collaborative evaluation of current and planned operations, conditions, and priorities. The objective of BIM is to cost-effectivey meet infrastructure requirements in support of an organizations mission, and to mitigate any preventative and unplanned disruptions to operations and/or compromises the financial position of the organization. This includes an asset management decision support capability the bases capital reinvestment upon financial and functional returns. All projects compete for organizational resources and objective criteria must be established to enable maximum utilization of these finite resources. Informed, goal focused decision support capability is a definitive source of opportunity for efficiency/productivity gains. Cost awareness across the organization is an important starting point. Everyone in an organization must realize that capital reinvestment decisions are inter-related and impact long term operational expenses. While uncertainty will certainly be present to some extent, virtually any facility life-cycle project or task can be modeled for decision-makers, and modeled over several timelines… 5 yr, 10yr, 50yr. etc. The mindset that performance and process improvement is ongoing vs. static must be adopted. This accounts for associate organizational “growth” or “shrinkage”, trends, regulatory impacts, etc. The overall goal is to maximize any ability to adapt, renew, renovate, recycle, reuse, and/or grow/shrink physical resources. So, assuming one proceeds down the BIM life-cycle facility path, what are the reasonable expectations? First, it’s important to understand that a phased approach is likely the best approach. Think of BIM as a large pie, one that you are going to put together a piece at a time. That said, you need the to be aware of the list of ingredients and how and when to put the ingredients together. Secondly, BIM / life-cycle facility management is verb, a process, not a one time thing… like a project. It’s primary gold is to improve upon the efficiency of impacts of the built environment, helping decision-makers compare and better select among available capital reinvestment alternatives. All decisions should consider space, equipments, physical and functional conditions, current construction cost estimates and operational cost estimates over defined periods of time. An ROI, Return-on-Investment business analysis is mandatory for all projects, inclusive of due consideration of any associated potential risks to the organization’s mission. So called , “lean practices” are an important objective, as are simple to use decision support and monitoring tools such as “dashboards” and associated key performance indicators (KPIs). Ongoing facility portfolio reassessment based on a routine and consistently conducted functional and physcial facility assessments associated with appropriate standardized and well vetted reference cost databases, cost models, and other tools such as GIS and BAS. 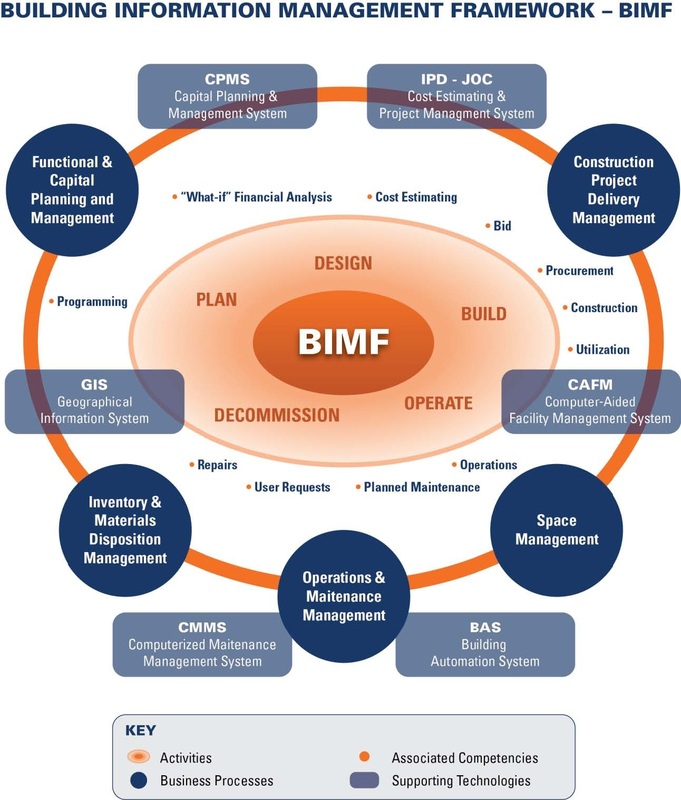 Efficient facility construction, renovation, repair, and sustainability process management methods such as IPD [integrated project delivery] and JOC [Job Order Contracting], which involve all stakeholders collaboratively from project concept and design, through construction and warranty periods are core components of BIM/facility-life cycle management. clearly articulate all associated business processes and workflows, and mandate their use, as well as the fact that all decisions must be outcome-based. Full training and support must be available as all levels, including access to all requisite tools, software, information, etc. Source of Quotations: Dawn Naney, Clay Goser and Marcelo Azambuja – “Accelerating the Adoption of Lean Thinking in the Construction Industry” on the topic of adopting lean management theory within the construction industry. For BIM to succeed will require a fundamental changes in how the AEC industry (architecture, engineering, construction) industry does business. 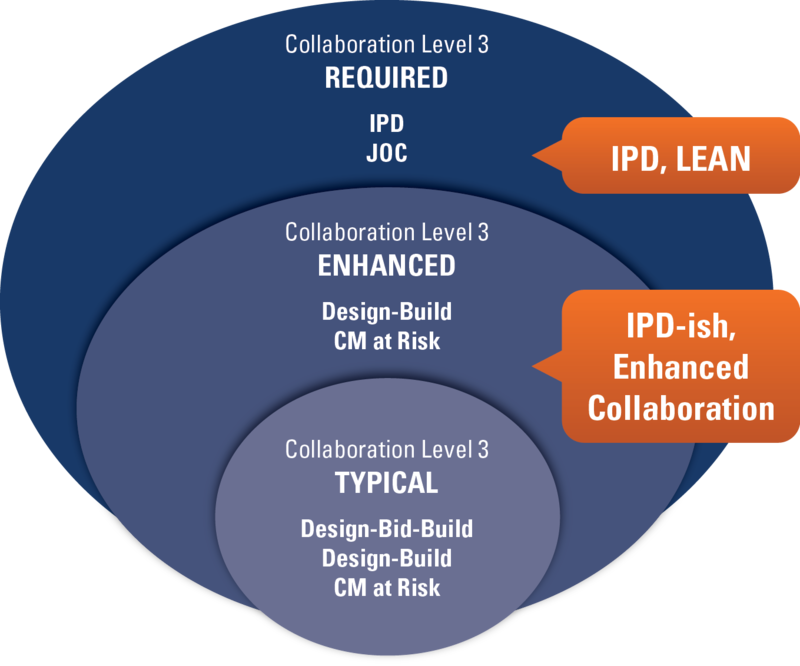 Integrated Project Delivery – IPD, Job Order Contracting, and similar LEAN construction methods will need be become mainstream. In the interim, BIM will be relegated to 3d visualization and an organic growth output of 2D CAD, vs. the process of efficiently managing the built environment supported by digital technology. The entire design and construction industry needs to rethink Lean in terms of overhauling entire project delivery models. Once it is accepted that the change is not a singular independent piece of a larger system, but an entire system of systems, teams can realign expectations not just around potential benefits, but the level of comfort (or discomfort) that will be required to transform an industry for the purpose of real strategic advantage. By examining Gartner’s five phases of adoption, one can identify interesting similarities to the construction industry’s acceptance of lean practices, organizational process change, and the ability to inform strategies to increase the speed of adoption. Our findings suggest that organizations can decrease time spent in the “Trough of Disillusionment” and accelerate the successful adoption of new process strategies such as Lean Thinking and Integrated Project Delivery and new technologies such as Building Information Modeling and collaborative tools through focused alignment and engagement. The key to the successful adoption of an innovative change is to ensure that the amount of time spent between entering the Trough of Disillusionment and the climb up the Slope of Enlightenment remains as short as possible. By reducing this period, industry moves faster in acceptance of perceived benefits and best practices are codified quickly. The Trough of Disillusionment also explains why technologies often fail. They never make it out of this stage and the technology is abandoned or replaced (Fenn and Raskino 2008). 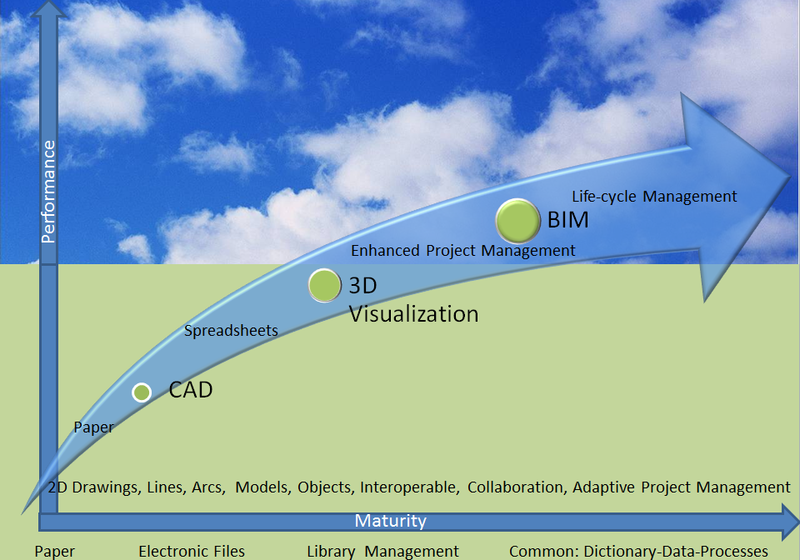 Many conclusions can be drawn from Lean Construction’s (BIM’s) adoption lifecycle. The first is that Lean Construction is a discontinuous innovation that requires a fundamental change to the way one conducts business. While Lean philosophy is not new to business and reduction of waste (non-value added activity) is firmly rooted in sixty years of development as illustrated in the Toyota Production System, it is relatively new to design and construction. The implementation of practices such as the Last Planner System, Set Based Design, Integrated Project Delivery, and Building Information Modeling, require a change in business practice. Finally, we have not created the “perfect storm” to accelerate adoption by selling Lean as a philosophy not a tool. The Early Majority is still looking for the clear definition (for examples, see Alves et al. 2010) and/or the checklist (“do this and you are Lean”). After 20 years of distributing the message, why haven’t (construction industry) people flocked to proven methodologies that have transformed manufacturing and other industries? If industry is to adopt Lean Thinking in construction, it needs to create a desire for stakeholders to participate differently to mitigate this risk. It needs to create a project delivery model that is rooted in the Lean principles and not just in the adoption of Lean tools. Lean Construction (BIM) while an important innovation with great potential and benefit as an idea, alone is not enough to tip the scales towards socialized adoption. We need to understand the barriers to that adoption in order to develop strategies to remove them. Understanding that the Design and Construction industry is huge and accepting that as an industry it is relatively conservative when it comes to change adoption and has grown to the present organizational models over a long period, one draws several parallels from other industries and areas of study. Key influencers must champion new ideas and have a message that is simple and compelling. In addition, there must be a contextual environment that promotes the change. When an environment deems a change as “optional” with no consequences, group dynamic will allow others to bear the responsibility for the change to the point where nobody will be responsible for the change. 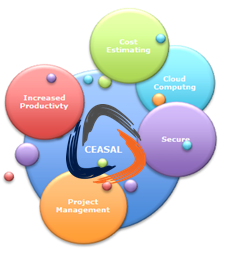 via http://www.4Clicks.com – – Premier cost estimating and efficient project delivery software for JOC – Job Order Contracting, SABER, SATOC, IDIQ,MATOC, MACC, POCA, BOA. Incorporates visual estimating, exclusively enhanced 400,000 line item RSMeans cost database, project management, contract management,. and document management.